Nutrition plays a major factor in good heart health. It can help you prevent cardiovascular disease, and it can also help reverse cardiovascular issues. 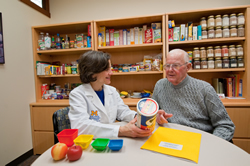 Michigan Medicine's Nutrition Services program, a division of Cardiovascular Disease Prevention and Rehabilitation, has certified nutritionists who educate patients and provide them the tools needed to improve cardiovascular health. Individualized nutrition counseling consists of as many as four appointments that starts with a thorough history, a nutritional assessment, which includes a dietary recall of food you ate over a certain period of time, a behavioral assessment to look at stress eating and other factors, a weight and body-fat assessment and waist measurement. Lab tests are reviewed and first recommendations for dietary changes are given. The remaining visits include tracking your progress, along with education on what to eat and what not to eat, how to select foods when dining out and grocery shopping. Our nutritional counseling room is equipped with a grocery store with shelves full of foods, which we use to teach you how to read food labels. We also teach you about portion sizes, using a special food plate that easily illustrates how you should portion different foods at home. For those having real trouble making dietary changes, we offer The Hunger Within Workshop – a treatment program that can provide real hope for lifelong weight management. This course of treatment takes the focus off of food and guides participants through an intensive program unlocking the psychological barriers to permanent weight loss. This concrete, step-by-step workshop explores the core reasons for overeating, identifies the triggers that precipitate a binge and helps break the vicious cycle of emotional eating.